Merry Christmas, everyone! As my gift to you this Christmas, I offer you a delicious recipe for Christmas cookies. All my life, I have loved shortbread cookies. I usually buy Walker brand, from Scotland, which are, thankfully, still made with real butter. I love the sandy texture, the sweet taste. But most of all, I love the butter. Butter is not only delicious, it's also very good for you. Someone once told me I should change the name of this blog from CHEESESLAVE to BUTTERSLAVE. It's a tough call. I love them both. Grass-fed butter is one of the very best sources of vitamin K2, which most of us need desperately. Especially kids and the elderly. Did you know that vitamin K2 is critical for building bones and teeth? Without vitamin K2, your body can't properly deposit calcium in the right places. Vitamin K2 is what helps put calcium into the bones and teeth. When don't get enough vitamin K2 in our diet, the calcium we ingest gets put into fatty tissue and organs — including the brain, heart and kidneys. Ever wonder why so many people get osteoporosis as they age? Why broken hips are so common among the elderly? And why so many of our elderly suffer from strokes (which can be caused by calcium deposits in the brain), heart disease (calcium deposits in the arteries), and kidney stones (calcium deposits in the kidneys)? See a pattern here? What we mistakenly thought was cholesterol deposits in the brain and arteries is actually calcium. Of course, it must be grass-fed butter. That means butter made from cream from cows on pasture. Vitamin K2 is produced in the digestive systems of cattle eating grass. Grass contains vitamin K1, which is converted to K2. If you feed a cow corn or soybeans, it will not create vitamin K2. I believe this is why so many American children today suffer from cavities and crooked teeth (I think we're at 90%), and why heart disease and stroke are some of America's top killers. In the past few decades, all of our cows were moved from pasture to factory farms. As a result, the milk and cream they produce is woefully inadequate when it comes to nutritional quality. On top of that, butter has been villainized by industrial food. Why? Because they want to sell margarine, Crisco and other synthetic, highly processed fats and oils. Of course they don't want us enjoying rich, creamy butter from our neighbor's cow! Where's the profit for them in that? If they make you think butter is bad for you, you'll eat their crappy margarine. Give someone you love something sweet and good for their health: sprouted flour shortbread cookies. These cookies are loaded with butter — almost a full tablespoon in every cookie. And this butter is chock-full of vitamin K2. I modified this recipe from one that I found in Cook's Illustrated. I love Cook's Illustrated because the recipes are tested and retested — and they always come out great. I've never had one fail. I've modified the recipe in a few ways. To boost the nutrition and make the cookies more digestible, I used sprouted flour instead of white flour. I used natural, unrefined sweeteners instead of refined sugar. I also used real sea salt instead of table salt, and grass-fed butter. If you don't know of a local farmer producing grass-fed butter near you, you can find it online or use Kerrygold Irish grass-fed butter, available in many supermarkets including Trader Joe's. I also changed the method somewhat. I didn't mean to do it — it was an accident. But it worked pretty well. Also, I haven't tried making these cookies with sucanat. The slightly more refined palm sugar and maple sugar worked very well. Next time I might do all palm sugar, since the maple sugar is a bit “mapley”. Very good, but mapley. Also, I forgot to reserve 1 TBS of sugar for sprinkling on top at the end (as specified in the original recipe). The cookies really don't need it, but if you want to, go for it. I'll experiment more with the recipe (I am actually making more cookies today — they go fast!) but for now, this one will do you proud. Makes 16 wedge cookies — 17 if you count the round one. You might want to double or triple this recipe — trust me, you will want to make more. 1. Set oven rack to middle. Preheat oven to 425 degrees. 2. Cut a round of parchment paper to fit in a 9-inch springform cake pan (optional — do this if you want to avoid the toxic non-stick lining of most springform pans). Set aside. 3. Add flour, all but 1 tablespoon sugar (reserve for sprinkling), and salt to mixing bowl. Mix at low speed until combined (or use your hands or a wooden spoon to blend). 4. Cut very cold butter into 1/2-inch cubes. 5. Add cutter cubes to flour mixture. Mix on low speed (or use your fingers to blend together) until the dough looks like wet crumbs. All the butter should be mixed in thoroughly. 6. Press crumbly dough into springform pan. Use your fingers, and then the bottom of a glass to press down on the surface and make it smooth and level. 7. Reduce oven temperature to 300 degrees and place shortbread in oven. 9. Remove pan from oven. Set on a cutting board. Let cool for 5 minutes. 10. Remove the top part of the springform pan and leave the shortbread sitting on the bottom piece. 11. Set the 2-inch biscuit cutter in the center of the shortbread. Press down hard. Pull up, leaving the center circular piece intact. 12. Using a sharp knife, cut the outer ring into 16 equally sized wedges. 13. Using a skewer or other pointy-tipped implement, poke holes in the top in a decorative pattern. 14. Return shortbread to oven and continue to bake until golden, about 40 minutes longer. You may want to put an extra cookie sheet underneath to catch the butter dripping (it dripped for me). 15. Remove from oven and sprinkle shortbread evenly with reserved 1 tablespoon sugar. Let cool for at least 15 minutes. 16. Cut at scored marks into wedges. Let cool for at least an hour. YUM! I will try this tomorrow! I can’t don’t do any sweetner but honey,do you think I could do this recipe with honey instead. Oh how funny! 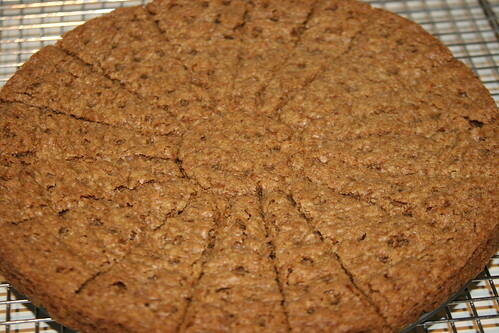 I made shortbread cookies last night with sprouted spelt flour, sprouted wheat flour, and brown rice flour. I used a combo of rapadura, raw honey and maple sugar for sweeteners and I used cultured 100% grass fed butter. I also threw in a tad bit of raw cocoa since I had a taste for chocolate. They were delish though not as photogenic as yours! I’ll have to give your recipe a whirl sometimes. Thanks! The rice flour gives the shortbread the “sandy” texture. I find it a must for all shortbreads. Tonya – I’m not sure — this is my first time experimenting with shortbread. Give it a try. Heather – Thanks! I didn’t know that. Shortbread cookies are one of my favorite things, too. Walker’s shortbread cookies are one of the handful of packaged, prepared items that are corn-free (and readily available) so my kids and I (corn allergic) keep them in the car for emergencies. I’ve not cooked with sprouted flour yet, but this will be my first recipe to try. As a southerner, I will probably convert these to pecan sandies using pecans from my Mom’s trees, though. I once made shortbread cookies and accidentally used double the butter and they turned out really crunchy (slightly greasy, too) with holes like swiss cheese and we ate them anyway. They were sort of a cross between brittle and shortbread, pretty yummy. Can you ever have too much butter? We don’t think so. Thanks for the great recipe. .-= kc´s last blog ..Roasted Onion Dip (Homemade and Corn-Free) =-. YUMMMY! Will you have extra around? Are we still good for Saturday?? I’m so excited! .-= Marillyn @ just-making-noise´s last blog ..Merry Christmas & December Photo Project – Day Seventeen to Twenty Five =-. I would like to know if vitamin K2 is heat-sensitive? Does anyone know whether vitamin K2 is stable at high temperatures or not? Does raw milk from grass fed cows NOT have K2 or is it just more concentrated in the butter? The raw grass fed butter is $10/lb and with as much butter as we eat I just can’t afford it; but 2 of our dc are drinking raw milk and I am going to start making raw yogurt so the other dd that can’t drink milk can have raw dairy (we lost our source of raw cheese). We’re using Blue Ice CLO with the butter oil… do you think that would be enough K2? BTW, I just read your twitter in the sidebar about the kolaches in West – Mmmmm. I haven’t been that way in a while but I remember them fondly. We just got in from a 6-1/2 hour drive through TX and got home just as it started snowing HARD. It’s beautiful! Thanks for sharing your recipe and inspiring us to make shortbread cookies. .-= Beth´s last blog ..High School History Part 2 =-. This is the kind of thing you can make for SAD eaters, and then they look at you and say, “Wait a minute, I thought you were a health nut!” LOL. .-= Emily´s last blog ..Eight Reasons To Eat Spinach =-. And this article says K2 is in all butter but in varying amounts. It would seem that the quality of the soil is the most important factor. It is important to note that commercial butter is not a significantly high source of vitamin K2. Dr. Weston A. Price, who was the first to elucidate the role of vitamin K2 in human health (though he called it “Activator X” at the time) analyzed over 20,000 samples of butter sent to him from various parts of the world. As mentioned previously in this paper, he found that the Activator X concentration varied 50-fold. Animals grazing on vitamin K-rich cereal grasses, especially wheat grass, and alfalfa in a lush green state of growth produced fat with the highest amounts of Activator X, but the soil in which the pasture was grown also influenced the quality of the butter. It was only the vitamin-rich butter grown in three feet or more of healthy top soil that had such dramatic curing properties when combined with cod liver oil in Dr. Price’s experiments and clinical practice. Therefore, vitamin K2 levels will not be high in butter from grain-fed cows raised in confinement feedlots. Since the overwhelming majority of butter sold in the U.S. comes from such feedlots, butter is not a significant source of K2 in the diet for most people. This is yet another argument for obtaining raw butter from cows raised on green pasture. Soil is important but it also needs to be from animals eating green grass. Green grass is what contains the K1 which is converted to K2. Mina – From what I have read, K2 is not altered by heat. Whole milk from grass-fed cows does have some K2 but K2 is concentrated in the butterfat, so it is much more concentrated in butter and cream. You’re not going to get decent amounts of K2 from milk. K2 is not affected by cooking so your butter does not need to be raw. It must be from grass-fed cows, but pasteurized is OK. I often by Kerrygold butter, which is from grass-fed cows, but it is pasteurized. Much cheaper than raw grass-fed butter. I do buy some raw grass-fed butter which I use for spreading on toast and bread (not for baking). If you are taking adequate amounts of butter oil, that might be enough… but I’m such a believer in K2 and grass-fed butter, I really don’t think you can get enough. So I’d use both. I don’t have extra cookies (we ate them all) but I am looking forward to seeing you on Jan 2! Synthesized by animal tissues, including the mammary glands, from vitamin K1, which is found in association with the chlorophyll of green plants in proportion to their photosynthetic activity. What a timely post (the part where you wonder about the naming of your blog). I’ve really enjoyed your blog’s information since I discovered it a few months ago. Nourishing food has become one of my passions this year. But I’ve also been irked by the name of your blog. I see by your pictures that you are white. I take offense, then, to using the word “slave” in your blog title. I should mention that I am also white and that one of the other areas I’ve been passionately researching is anti-racism. Using “slave” in any favorable context (no matter how the dictionary might describe it) is racist in this country because you are white and white people hold institutional power and, obviously, the word “slave” in this country comes with all sorts of horrible history. I fully expect you to moderate this comment and not post it on your blog, as that is your right. I hope you know I really truly value the nutritional information you provide and how much time and effort you put into this blog. I just realized how crummy I felt after recommending and referring to your blog (by name) to my sister-in-law (who is a person of color) and saw the look of hurt flash across her that I would be extolling something that uses a term that so easily denigrates her and her history. A few months ago, I wouldn’t have batted an eye at using phrases like “a slave to fashion” etc. but now realize that because I am white, I do not have that ‘luxury’. Thank Ann Marie. I had read both those quotes from the article. No where did the article say that animals eating soy or corn did not make K2. I’m wondering the source for that specific comment you made in your post. I am very aware of how commercial factory farms feed, the large amounts of concentrates (grains and other items) along with hay and/or silage. No grass. But the majority of grass based farmers feed some amount of grain/concentrates, most particularly corn, and always have….otherwise it is hard to get a cow to stand still for milking. So if K2 is not made from animals eating such things, then most butter, commercial or not, would have little K2, regardless of grass eating. And what would it be about corn & soy in particular? What about cotton seed & their by products, wheat, oats, etc.? I’m not sure if I understand what you are asking. Feeding some grains to mostly pasture-based cows isn’t going to prevent K2 production. Is that what you are asking? Cows that eat corn and soy and no grass are not going to produce adequate K2. Cows that eat mostly grass are going to produce higher levels of K2. K2 is converted (via bacteria in the digestive tract of ruminant animals) from K1 which is present in grass other green plants containing chlorophyll. For this form of the vitamin to occur in these animal products, Weston Price’s observations remain true: it is found in the fats of animals consuming a lot of plant matter that’s high in phylloquinone, vitamin K1. For land mammals, that means those raised on pasture, and in particular, those eating the rapidly-growing grasses of spring and fall. So much for “I’m called Little Buttercup… though I could never tell why…” Now we know. Buttercups flower most prolifically in springtime, when the butter is best. In the springtime too, when the grass is growing quickly, plants produce significant amounts of vitamin K1, which ruminants conveniently transform into Vitamin K2 for us (thanks, ruminants!) when we consume their delicious fat in the form of butter. I am sorry you take offense to the name of the blog. It came from my feeling of enslavement to cheese and full-fat dairy products. I understand where you are coming from and I’m sorry it caused you or anyone else any distress. However, I also know that one can’t please everyone. I offend people I interact with on a pretty regular basis just by being me (and not being exactly like them). I could give you a litany of examples. Here’s one: I say “Jesus Christ” pretty commonly as a turn of phrase — usually when stressed or exasperated. I grew up in New York (among many Jewish friends and neighbors). It’s something I heard often growing up — and it became a part of my speech. It’s not something I do on purpose — it’s more of a reflex. This offends some of my Christian friends and they have let me know about it. I’m not Christian so it never bothered me to use this expression or to hear others use it, but I can see how it might offend them. However, I have also been offended by other things people say. Like for example when people say something is “gay” — meaning that it’s stupid or dumb or they don’t like it. This implies that gay people are “less than”. I have many gay friends and I don’t like it when people use that expression. Also when people say things like, “You throw like a girl.” Very offensive to women and girls. So I get how words can offend people. Even when people don’t mean to offend. slave (n.) c.1290, “person who is the property of another,” from O.Fr. esclave, from M.L. Sclavus “slave” (cf. It. schiavo, Fr. esclave, Sp. esclavo), originally “Slav” (see Slav), so called because of the many Slavs sold into slavery by conquering peoples. I’m half-Polish (a Slav) so maybe I should be offended by my own blog title too. I’m being facetious here but I think perhaps we can all lighten up and be more tolerant of each other. If I used this blog to spew racist nonsense, I could see why someone would be offended. But to be offended by the word “slave” used in the title seems a bit extreme. The truth is, regardless of our race or color or ethnicity, whether we are Jewish or Polish or African-American or Arab or Greek or British, all of our ancestors have been slaves at one point or another in history. Interestingly, slavery was only started after agriculture started — about 10,000 years ago. Hunter-gatherers did not enslave people — there was no need. Great discussion on this in Lierre Keith’s new book, “The Vegetarian Myth” (which I am about to write a review of). Agriculture required a ton of unskilled labor, and a ton of land to grow annual crops. Which is why you saw cultures like the Roman Empire which was all about expansion to new territories and enslavement. Maybe I’ll rename the blog to The Spartacus of Cheese (Spartacus was the story of the famous slave in Rome). It just doesn’t have the same ring to it. Wow! We made the shortbread cookies for our New Year’s Eve celebration. Everyone liked them. We added chopped pecans as one the comments suggested. We also used all palm sugar and it turned out great. Thanks for the recipe and all your hard work. Based on the articles you have quoted in the comments, this is not the case. It is the exclusion of grass that significantly reduce or eliminates K2 production (since K2 comes from K1 produced in green plants). I was concerned about the statement because if corn & soy eliminate K2 production, then I need to know what elements in those two things, corn & soy, eliminate K2. I can see significant changes in the color of my milk & butter when my cows get even a small amount of green grass. But I also feed them (far less than factory dairies) a grain & alfalfa feed that includes some corn & soy. And since the feed includes oats, I was concerned any grain feeding would cause a K2 problem. But my Jerseys need the extra nutrition of the concentrated feed (I can explain in more detail why this is but here is not the place). There are cows that can produce a decent amount of milk and maintain their body weight on grass alone but there aren’t many yet. Some grass based dairies are working on this but it will take some time. In the meantime, most of your readers are likely buying milk from cows that receive grains, including some corn & soy. I suggest you clarify such statements in the future…..eating grass is the key, as you have noted. But corn & soy do not eliminate K2 production. I hope that clarifies my point/question. May I ask if your cows are getting organic feed? If it contains corn and soy, I assume that they are getting conventional, genetically modified feed then as I understand that organic feed with both organic corn and organic soy would be prohibitively expensive? I personally know a few farmers who feed their dairy cows 100% grass and/or organic hay, so there’s a lot of cow talk going on. I also have a good friend who feeds her cow 95% grass/organic hay and a small amount of organic feed when she milks twice a day. However, this feed contains neither corn nor soy. One of the organic dairy farmers who has jersey/holstein cross cows that are 100% grass fed does regular testing and they have tested at 4.5% butterfat and he milks once a day. Another’s (organic certified 100% grass fed as well) has has his 100% jersey cows tested at 4% butterfat but he milks twice a day. My friend’s jersey/guersney cross tested at 6.2% butterfat, but, again, she is also feeding her cow a small amount of grains (equivalent to about 2 quarts per day). I also understand that quality of the soil and pasture is also a major factor in not only the butterfat and protein, but the overall quality of the milk produced, so these things can vary widely from farm to farm. My apologies for not completing my earlier thought — my children were waking up just as I was getting toward the end! Anyway, most raw milk consumers that I know personally — and that is about 100 or so since there is a raw milk bill currently before the legislature in our state (so I actually know of far more, but I know that many by name) — seek out dairy farmers who are certified organic and who have cows who are 100% grass/hay fed, or, if they do give their cows a minimal amount of grains, it is organic feed and contains no soy or corn as those are almost guaranteed to be genetically modified. The farmers I know are (almost) obsessed with the quality of their soil and pasture and regularly rotate their animals — even the ones with a single family cow. And yes, the quality and color of the milk — as well as the quantity of butterfat and casein, does change throughout the year. Where I live, the “best” time of year for dairy products is May and June when I stock up on “summer butter” when the prices also go up. I have about 15lbs of summer butter in my freezer right now along with about 5 gallons of 100% jersey milk “in case of emergency”! I also ordered 30lbs of cheese made from summer milk. The milk was nearly yellow due to the higher butterfat content until late September and is now returning to white. Some of it still has a slight yellow tinge depending on the type of cow. Right now the pastures are all buried under at least a foot of snow and the cows are munching on organic hay, so it makes sense that these changes would be occurring. Very best to you and yours … off to tend to the kids again. I would have to suggest leaving corn and soy out of the feed as well. In our country, it is almost impossible to get any corn or soy that isn’t contaminated with GMOs. I don’t think it would be so horrible to feed some grains while milking as long as those grains did not include corn or soy. Beets should also be avoided for the same reason and I read that rice in on the horizon as the next “GMO target”.. Sometimes writing blog posts, esp. when you have just an hour or two while on vacation with family, is challenging. We don’t get paid to blog and we don’t have editors or copyeditors to check our work. I do the best I can to get the information out there. KC makes a good point. All GMO grains should be avoided. Yay, Rebecca! I’m so glad you liked them! i had to post this after reading this recipe! i just made some bread pudding with my left over end pieces from my sprouted grain breads that were frozen. i wonder if i can just take sprouted grain bread and grind it up and use it to make other things? I put sprouted grain bread or sourdough bread in my food processor and make bread crumbs which I use to make chicken nuggets or fried chicken, friend chicken livers, or other things requiring bread crumbs. I don’t think we have sprouted grain flour in the Philippines. I could probably make my own but I’m not sure how. Can you help me? .-= Divina´s last blog ..Meatless Challenge: Lentil Stew =-. Thanks for the suggestion to put a cookie sheet underneath because pieces of the cookies fell while baking. Now I don’t have to clean the bottom of my oven! these crackers sound so good. thanks for the recipe’. wow, that looks so good. I love shortbread!